Have you ever wondered why the progress runtime (prowin32.exe to be precise) takes such a long time to start? Especially in comparison to other runtimes like JVM or CLR? The surprising answer is: It doesn't take long. It just sleeps for 2 seconds while showing the well known blue splash screen (or the orange one if you are on the latest version). On my machine it takes 2.15 seconds to start prowin and run a simple procedure containing just a QUIT statement. If we turn off the splash screen by using NoSplash=yes in our progress.ini file, it only takes 150 ms. This way the 2 second penalty even vanishes when running a program from Developer Studio, where it annoyed me the most. Should you already be using a custom ini file with your application (loaded by -basekey INI -ininame file.ini) , the registry settings have no effect. In this case, you have to add the NoSplash entry to the corresponding ini file. If you ask me, as a developer, Progress should change the default setting and turn the splash screen off, at least for the Developer Studio. And if that is not going to happen, what i assume, please document it more prominent. I suppose I am not the only OpenEdge Developer who was annoyed by the slow startup, and unaware of the solution. In fact, I knew the NoSplash option for quite a while, but I was thinking that it would only disable the splash screen (not my intent), which kept me from trying it out. Set to YES to turn off display of the splash screen. By default, the OpenEdge GUI client and the WebClient display a splash screen during startup. 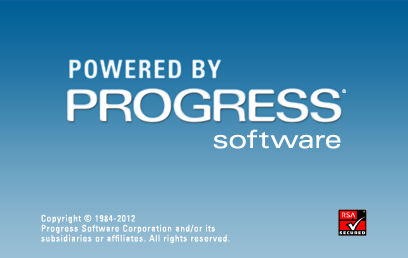 The screen, which is a blue rectangle with the words “Powered by Progress Software,” disappears when the OpenEdge application starts. I think it could be described more clearly. Especially the diction "during startup" underpins my wrong intuitive comprehension. The wonderful world of Progress... Thx for the tip! You sir made my day! I knew the ability existed to turn of the splash screen, but never figured it would actually make the startup 2 seconds faster. Thanks! Thank you for the wonderful article useful information!